From the summit of Mount Columbia at 14,073’, this view looks across the saddle to Mount Harvard at 14,420’. To hike these peaks on the same day, it’ll cost you 15 miles and a very early start in order to avoid any late morning or afternoon storms as your time above treeline is something of which to be aware. The Rocky Mountain landscape at this altitude is amazing. 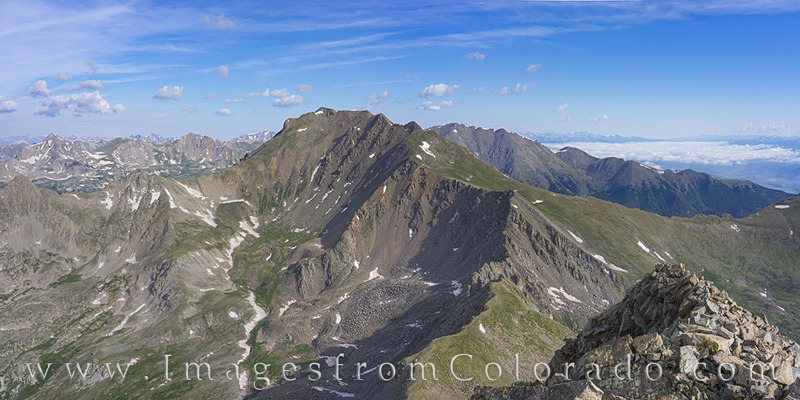 These collegate peaks are found in the Sawatch Range near Buena Vista, Colorado. Photo © copyright by Rob Greebon.